We've been blessed with premium grade interchangeable lens compacts of late that have blended pleasing form with excellent functionality – chiefly those from Fuji's 'X' series and Olympus' OM-D and Pen camera ranges. 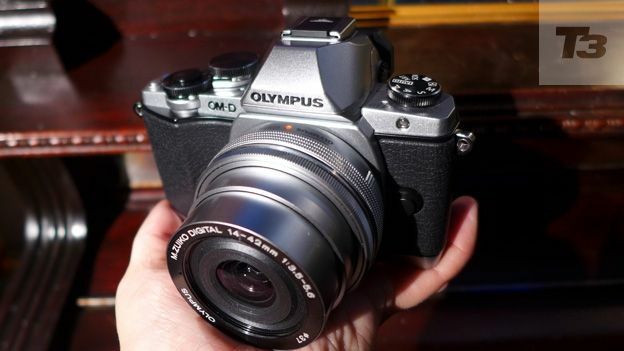 The difference between the latter two options – OM-D and Pen – has chiefly been price and portability, but the latest OM-D in the 16 megapixel Micro Four Thirds system Olympus OM-D E-M10, reviewed here, is both the most compact OM-D to date and the most affordable too. Conceivably anyone who has been lusting after the high end Olympus E-P5, might also now want to take a look at the E-M10. With its shrunken DSLR-like styling, the most obvious advantage here is an eye-level viewfinder, plus its maker has also found room for a tilting LCD screen at the back. In its black and silver combination that we reviewed, the E-M10 doesn't unduly suffer in comparison with its pricier siblings in the weather proofed range-topping Olympus OM-D E-M1 and older OM-D E-M5. The cover that protects the compartment housing both rechargeable battery and optional SD media card at the base of the E-M10 was the only element that seemed noticeably plastic-y or 'budget' feeling to us. There's enough space to put your hands and the layout didn't feel as cramped as its predecessors. Altogether it feels a little less over-engineered than the E-M1 and E-M5, and, if you don't need the pro-level weather resistant body, the E-M10 is all the better for it in our opinion. And the body here is sturdy magnesium alloy anyway. There is, however, some very strong competition on the market in the E-M10's category, not least from the Fujifilm X-A1 and Fujifilm X-E2, but also the Sony A5000 and Sony A6000, the Samsung NX300 and Samsung NX30, the new Nikon 1 V3, plus the impressive Panasonic Lumix DMC-GX7 and GM1. The Olympus retails for a suggested £699.99 with the ultra compact 14-42mm zoom we had for review, which feels fair, said lens extending automatically when the camera is switched on, rather than having to be manually extended, as with earlier iterations of the same lens. In terms of controlling the 14-42mm lens supplied, barely a couple of centimetres in depth when retracted, unlike your average electronic zoom we were still able to zoom in or out by turning a ring on the lens barrel, rather than togging backwards and forwards via a zoom lever on the camera itself. While the automatic nature of the lens made for smoother zooms when shooting video, we did find it slower to respond than a manual zoom when attempting to compose our photographs, when simply a quick flick of the wrist would have nigh instantly got us where we wanted to be. But there's always the option to go for one of the 16 directly compatible Micro Four Thirds lenses including manual zooms. If you buy a lens adapter for the OM-D E-M10, choice is extended to around 60 lenses, including those for older Four Thirds system DSLRs and original film shooting OM cameras. Atop the camera, giving it a rangefinder-like look, we get two unmarked control wheels, the foremost one encircling the raised shutter release button. The one toward the rear can readily be operated by the thumb to scroll up and down through menu screen options, or alternatively enlarge a portion of an already captured image on screen with an anti-clockwise twist. A clockwise twist, does the opposite and instead displays previously captured images as a series of thumbnails. Across the raised hump that houses both the eye level electronic viewfinder and pop-up flash, at the other end of the top plate we find a familiar bottle top style shooting mode wheel. Here we get the regulars of Program, Aperture Priority, Shutter Priority and Manual modes, along with the failsafe of scene and subject recognising intelligent Auto (iAuto). This being an Olympus camera, the mode wheel also has access to the built in digital effects, of which there are 13 options, including our favourite of the HDR image-like Dramatic Tone, alongside Pop Art, Pinhole camera and Diorama options. A video mode is also present on the same dial. Though we were able to start and stop filming with a press of the dedicated red record button on the E-M10's top plate, this movie menu also allows colour saturation to be adjusted and short clips to be filmed in black and white. The adjustable 3-inch monitor on the back of the E-M10 is also a touch screen, although it's not immediately obvious as on-screen settings are so tiny we had to be quite precise with our finger taps. As noted earlier there's also a traditional eye level viewfinder provided on the E-M10 - not a feature that we always find in this price bracket. It even comes with a built-in eye sensor, so as we move our attention from the large LCD to the smaller window above, it automatically activates for seamless operation. Remove an eye from the viewfinder the main LCD switches itself back on like magic. It's also well worth giving praise to the resolution provided by the OM-D E-M10's viewfinder and LCD – the former housing a whopping 1.4 million dots and the latter 1.037. As a result the viewfinder doesn't feel pokey and blurry compared to the larger screen. While the 3-inch LCD can be tilted up or down, it cannot be flipped completely so that it's facing the subject before the lens for selfies. Nor can it be flipped outwards from the body so it is sitting alongside it, as with the screen on any camcorder and competing interchangeable lens cameras including Samsung's NX30. However Olympus would very likely argue that this would have added to the camera's bulk. The chunky BLS-5 battery that slots into the base of the OM-D E-M10's handgrip is charged via a standalone charger, rather than its manufacturer stinting on the basics and asking us to charge it within the camera body itself. Battery life is good for around 320 shots from a full charge which is perfectly respectable for a camera in its class; yes Sony's previously reviewed A5000 may offer 420 captures from its own battery but this is the noted exception rather than the rule. The E-M10 produced cracking pictures during the course of our testing period, with plenty of punch provided. If we wanted to add a bit of extra 'zing' then we merely reached for the Dramatic Tone option in the Art Filter mode, to provide a bit more contrast and depth to shots. You would imagine that you were looking at pictures taken with an SLR rather than a compact, which makes the asking price worth paying, especially if you prefer a smaller overall form factor. Yes, compact system cameras have long promised results similar or a match for DSLRs, but we only feel it's very recently that we've come across a couple of cameras – the other being the excellent Fujifilm X-T1, for which we can say that claim starts to ring true. As noted earlier, it's when shooting video that the mechanical zoom supplied comes into its own, drifting smoothly through the shot avoiding any jerky movements that the less experienced videographer might add if making manual adjustments. We'd prefer to use a manual zoom for stills, and the supplied lens for video if we had a choice, but there's no doubt that the bundle here makes for a tight, manageable package capable of some quite excellent results. If, like us, you've hankered after the more 'classic' models in Olympus' contemporary OM-D range but baulked at the £1,000+ price tags, then the £699, 16 megapixel OM-D E-M10 and zoom lens combo is the answer to your prayers. Not only does it look and feel great, but When it comes to image quality, the E-M10 doesn't disappoint, providing detailed, colour rich images.